Crime • Sherry Black was beaten, stabbed in her store in 2010. 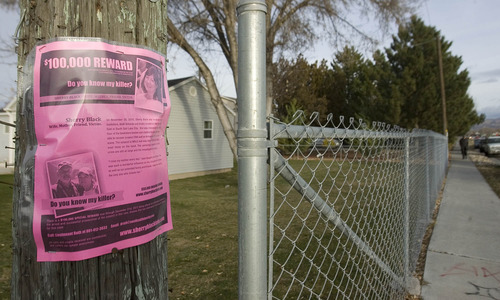 Paul Fraughton | The Salt Lake Tribune On the second anniversary of Sherry Black's murder, family members and friends posted signs around the Blacks' neighborhood, asking for information and offering a $100,000. reward. Friday, November 30, 2012 Paul Fraughton | The Salt Lake Tribune On the second anniversary of Sherry Black's murder, Sherry's daughter, Heidi Miller, staples a sign on a post near the Black home. Family and friends of the Blacks and Millers gathered at the Blacks' business and home to canvas the neighborhood and post signs asking for information and offering a reward. 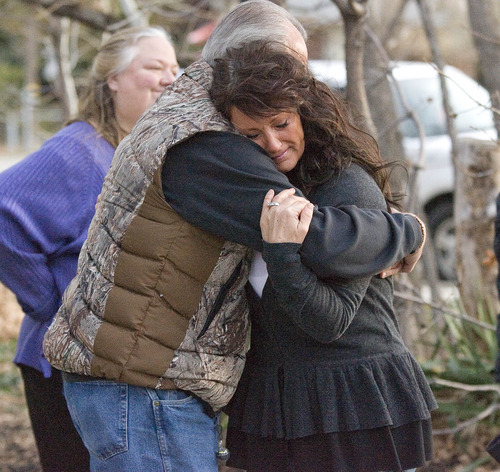 Paul Fraughton | The Salt Lake Tribune On the second anniversary of Sherry Black's murder, Sherry's daughter, Heidi Miller, hugs her father, Earl. They were joined by family and friends to canvas the neighborhood around the Black home and post signs asking for information and offering a reward. 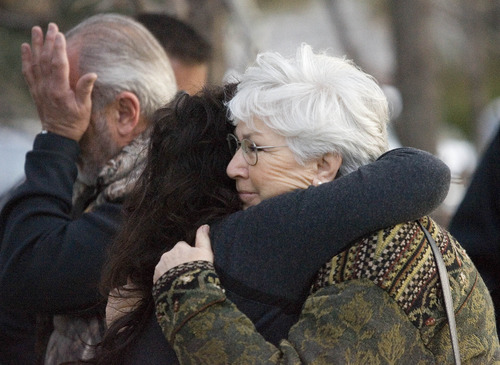 Paul Fraughton | The Salt Lake Tribune On the second anniversary of Sherry Black's murder, Sherry's daughter, Heidi Miller, hugs her mother-in-law, Gail Miller. The Miller and Black families were joined by friends to canvas the neighborhood around the Black home and post signs asking for information concerning the murder and offering a reward. 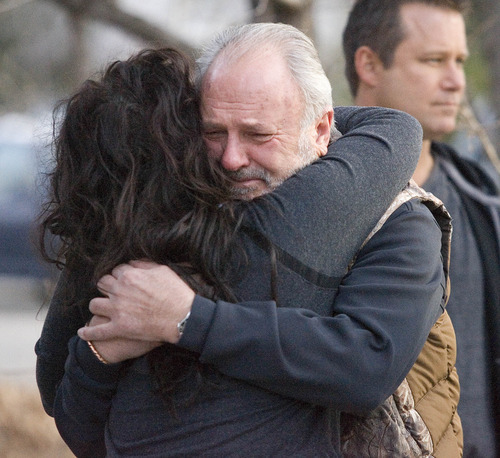 Friday, November 30, 2012 Paul Fraughton | The Salt Lake Tribune On the second anniversary of Sherry Black's murder, Sherry's daughter, Heidi Miller, hugs her father, Earl. They were joined by family and friends to canvas the neighborhood around the Black home and post signs asking for information and offering a reward. Friday, November 30, 2012 Sherry Black was murdered in her South Salt Lake home and book shop on Nov. 30, 2010. Police have no suspects or motive in the crime. Heidi Miller grabbed a pink flier and stapled it to a pole outside the bookstore where, two years ago to the day, someone murdered her mother, Sherry Black. She and her family said Friday morning they aren&apos;t resting until the killer is caught  and they&apos;re ready to offer $100,000 to see that happen. On Nov. 30, 2010, Sherry Black, 64, was beaten and stabbed at her South Salt Lake bookstore, B&W Billiards and Books at 3466 S. 700 East. Black&apos;s family has posted her face on billboards, created a website and offered a $50,000 reward to find her killer. Thus far, it hasn&apos;t worked. But her loved ones hope a doubled reward and a new reminder of the case will spark a new lead. About 30 family and friends fanned out Friday from her store to post fliers within a mile radius to keep the case fresh in people&apos;s minds and announce the new $100,000 reward for information that leads to the arrest and conviction of her killer. Black&apos;s family also sent out a mailer this week to 6,000 homes and businesses announcing the new reward. The $100,000 reward lasts through Dec. 31. Come 2013, the amount returns to $50,000. It&apos;s particularly difficult for the family that Black died during the holidays, said South Salt Lake police spokesman Gary Keller. The icicle-style Christmas lights that hung outside her store the day she died are still there above dark windows and a "Closed for business" sign. "She&apos;d be working on her books [about now]," her widower, Earl Black, said, fighting tears. "We really need to find this guy." Greg Miller, Black&apos;s son-in-law and CEO of the Larry H. Miller Group, which owns the Utah Jazz and other businesses, pleaded for anybody who may have seen or heard anything to come forward. "She was a 64-year-old lady, unarmed, without an enemy in the world. Everybody loved her, and someone came in and brutally murdered her," he said. A crime scene cleanup crew billed the family for 32 hours of work, if that gives any idea how bad the attack was, Miller added. Not only do family members want to catch Sherry Black&apos;s killer, but they also want to take a dangerous person off the streets before someone else&apos;s loved one is harmed. "If that person did it once," Miller warned, "they could do it again." Black&apos;s loved ones hope their efforts help close a case that detectives from across the country have tried to solve. South Salt Lake police have consulted with detectives from Salt Lake County police agencies, as well as an FBI profiler. Earlier this year, police reached out to members of a Philadelphia-based club of detectives called The Vidocq Society, who flew to Utah to look at Black&apos;s case. The Vidocq detectives and FBI profiler said the clues point to the killer being a young man  under 30 and maybe a juvenile, who probably lived in the vicinity of the store, possibly within four blocks. But, if so, the killer may have moved since then  about 70 percent of South Salt Lake residents live in rental properties. There was also an Armani Exchange belt  for a 36- to 38-inch waist  found beside Black&apos;s body, one that does not belong to anyone in her family. Photographs of the belt show the trademark letters "AX" on the buckle and the numbers 323 on a sticker on the buckle&apos;s back side, numbers that could be an item or inventory number from a store or thrift shop, according to police. Investigators also have a blood DNA sample from the attacker, likely from a hand wound suffered in the fight, that is run for a possible match every week. But police have no suspects or persons of interest. "We need that one shred of evidence that&apos;s going to pull all this together," Keller said. The prolonged investigation also has been hard on the officers, Keller added, as they&apos;ve followed up on every lead to try and bring closure. Heidi Miller said she felt appreciative for everyone who came out Friday to help her family. She tries to focus on her memories of her mother, how good of a person she was, and wishes the case could be solved. 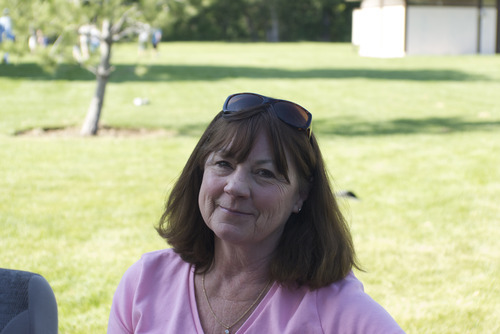 "It means a lot to me to see her [Heidi Miller] improve," said her niece, Carisa Miller. She added that seeing people working toward closing the case comforts her aunt and helps her cope with the loss. "Somebody knows who did this," said David Blain, president of the Miller Group&apos;s Saxton Horne Advertising, who paired up with Carisa Miller to post fliers around 3900 South and State Street. "[The group does] a ton for their employees. This is just a little thing we can do for them." Anyone with information about the case can contact South Salt Lake police by calling 801-840-4000. Sherry Black&apos;s family has created a website to promote the case at sherryblackinfo.com. All calls received are confidential, and callers can remain anonymous, according to the mailer. Though the mailers went out earlier in the week, Keller said he is not aware of any new tips so far.